Described here are congenital eye conditions that appear to be heritable or eye conditions and diseases in which there appear to be a particular breed predisposition. Condition in which extra eyelashes grow from abnormal follicles located on the inside edge of the eyelid. They may be singular or multiple. When eyelashes growing from normal sites turn inward. The eyelashes are often abnormally long. A change in structure of the lens of the eye leading to cloudiness and usually to blindness. Common in old dogs. Cherry eye, also referred to as prolapse of nictitating membrane. A condition where the third eyelid is protruding. Read more about cherry eye. Ectropion is a condition in which the eyelid rolls out, or drops away from the eye. A responsible breeding programme will choose animals for breeding with a more normal head conformation, so as to select away from exaggerated facial features, such as excessively prominent eyes and heavy facial folds, and the problems associated with them. Entropion is the reverse condition of ectropion: the lid is abnormally rolled in, causing a constant irritation to the eye. Eversion of nictitating membrane, also called 'cherry eye' is a condition where the third eyelid is protruding. KCS or "dryeye" is a condition where one or both eyes do not produce a normal amount or type of tears. Deficient tear production causes chronic irritation of the cornea and conjunctiva. Corneal ulcers and eventually corneal scarring occur as a consequence, resulting sometimes in blindness. There is an association between removal of a prolapsed nictitans gland ("cherry eye") and the development of dryeye. A developmental abnormality where the membrane forming the iris does not form properly. The Bulldog Information Library 2003-2010 © All rights reserved. Original idea, design and development by Catherine Marien-de Luca. 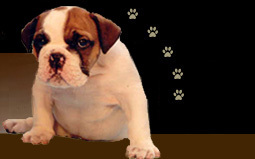 No part of bulldoginformation.com may be copied, distributed, printed or reproduced on another website without the owner's written permission. Please feel free to link from your site to any of the pages on this website in a non-frame presentation only. "A Guide to Hereditary and Congenital Diseases in Dogs" Published by The Association of Veterinarians for Animal Rights, First printing: August 1994. Canine Inherited Disorders Database, University of Prince Edward Island, Canada.